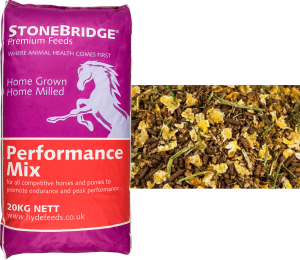 Stonebridge’s Performance mix is a palatable muesli especially formulated for the competitive, high performance horse in show jumping, dressage, eventing etc. To meet the demands of the performance horse, special proteins, minerals & vitamins have been added. This blend also has Yea-Sacc1026 added to boost the efficiency of the digestive system. This is a complementary feed to be fed in conjunction with suitable forage to ponies or horses. Stonebridge & designed for the health and mobility of the horse or pony. Minerals. Rich in vitamin E & selplex. and helps to improve fibre digestion.